What’s the most famous climb in the Vuelta? The race climbed up to the Lagos de Covadonga yesterday – pictured – but arguably the most well-known climb in this year’s edition is… the Col d’Aubisque, used when the Vuelta slips into France for a day. It’s telling that a foreign climb grabs the limelight, as good as the Vuelta can be when compared to the Tour de France and Giro d’Italia one big missing item is a repertoire of mythical climbs. It’s not that Spain is flat, nor its mountains uncharted, there are some famous climbs. Last weekend’s Alto de Naranco, the Lagos de Covadonga, the Angliru, the Bola del Mundo are all examples but they’re not in the pantheon alongside the Tourmalet, Galibier, Stelvio, Gavia, Mont Ventoux or Alpe d’Huez. What has made the climbs so famous? Repetition for a start, regular visits by the the Tour and Giro which have both being going for longer since the Vuelta means the Tourmalet and Galibier enjoy a big head start. Repeat visits increase the chance of important moments in the race taking place, not every ascent of Alpe d’Huez or Mont Ventoux has defined the race but some have and so they’ve become famous thanks to the exploits of Fausto Coppi. The Puy-de-Dôme is still famous despite the climb being closed to cyclists and impractical for the Tour de France. History plays a part, there many books chronicling the Tour and Giro but there are far fewer on the Vuelta (if you want one in English, look at Viva la Vuelta). There can be other factors, proximity is one for the way it’s possible for fans to ride one big climb and then another on the same day whereas the Vuelta’s famous climbs are not packed next to each other which brings us to the business of tourism. The Alps are a big tourist destination in summer and winter alike in the way the Asturias or Sierra Nevada are not, which means there’s more money for local authorities to buy a stage of the race. There’s a sense of place too, history means that the climbs alone are not famous but the approach roads, valleys and associated climbs are too in a way that even the most ardent cycling fans outside of Spain probably can’t rattle off five attractive climbs within the vicinity of La Camperona. Does it matter? There are plenty of great climbs that are not famous but there’s something to said for familiar climbs. It’s like a form of branding, everyone knows what they’re going to get, a comforting sense of familiarity for followers. They say “familiarity breeds contempt” but Tour and Giro are only once a year so even the Tourmalet isn’t too boring. All together these famous climbs are a valuable cultural capital. The good news for the Vuelta is that it doesn’t take too long to create a famous climb. Alpe d’Huez was first used in the Tour in 1952 but it was really repeated use from 1976 onwards that put it on the map and it probably established itself as a cycling destination in the late 80s helped by La Marmotte, the world’s first cyclosportif event. Or just look to Italy where the Giro has showered celebrity on the Mortirolo and Monte Zoncolan in no time, they first used in 1990 and 2003. Arguably this is what we’re seeing now with climbs like the Lagos de Covadonga (first introduced in 1983), Angliru (1999), Bola del Mundo (2010) and La Camperona (2014). 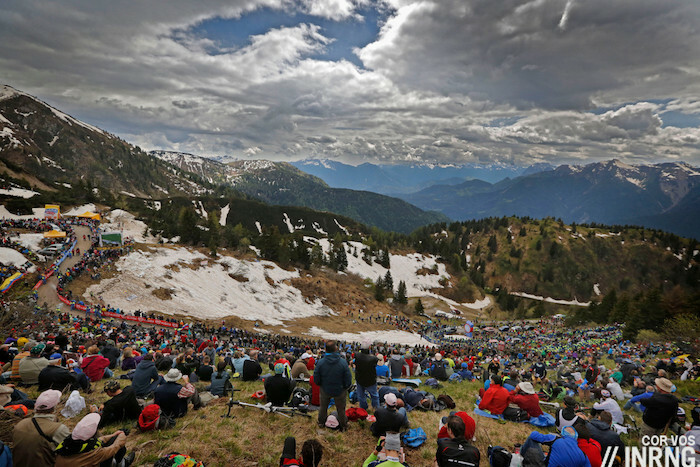 There’s another similarity with the Mortirolo and Zoncolan in that the newer the addition, the fierce the climb as races seek out savage slopes to tempt TV audiences. The most famous mountain in Spain among cyclists? Mount Teide probably gets more mentions as a training venue than many of the raced climbs. This is changing though as the Vuelta seems to be returning regularly to the same climbs. The Vuelta’s French takeover back in 2008 has been credited by some for a shake-up in the race and it’s true that the addition of some new climbs dates from this deal but it could just be coincidental; these steep and decisive mountains are good for TV audiences and ensure a winner who will be acclaimed by the public. It’ll take a while before convoys of Dutch cyclists head to the Angliru in the same way the aim for Mont Ventoux but the more familiar the climbs of Spain become the more they’ll become a riding destination and this virtuous cycle will reinforce the celebrity of these mountain roads. Nice article, I visited Spain last year during the vuelta and was in Andorra, San Sebastian & Asturias. Asturias are beautiful, definitely less cyclo tourists than the Alps or Pyrenees but the day my friend and I went up the Angliru there were plenty of cyclists plus a couple tour groups – helped that the vuelta passed through the town at the base that day. Covadonga was quiet though – lots of tourists to visit the church at the bottom of the climb though. I got the sense that the Asturias are a pretty decent tourist area but perhaps more focused on Spainish tourists and more general outdoor recreation tourism. An area with huge potential! Its a bit of a shame when climbs terminate at the top rather than giving options of making a loop, Angliru and Covadonga both have only one way up and down. Even Alp d’Huez can be made a loop. I know for me a climb is far more attractive and more of a destination when you can go up one side and down the other. I hope the Vuelta continues to grow in stature, especially with the ASO’s takeover and the nonsense of making it two weeks goes away for good! I was going to say, the Angliru seems to be pretty popular and I thought it was well known as one of the hardest climbs in pro cycling? I guess it maybe lacks the classic battles that have graced the slopes of the major Alpine climbs (although Horner v Nibali on Angliru in the 2013 Vuelta was pretty epic), but as Mr Ring says, that will surely come with time. The Angliru seems to be establishing itself as one of these climbs. Maybe Pena Cabarga will too. Only problem with Angliru is once you have done it, no way you want to do it again!! This really made me appreciate the pros ‘complaining’ that some climbs are too steep – i have to agree! After around 12% it is just too much if it is some sustained distance. “The Angliru is a mountain that suits nobody.” -Steven de Jongh, 9.3.11. Next to Mount Teide there are of course the unsung climbs near Girona, and especially on Mallorca, that attract many cyclist from northern Europe for pre-season training camps. These may even see more action than some of the alps mentioned. also, the names of Spanish mountains don’t roll off the tongue particularly well. audibly compare Alto de Naranco, the Lagos de Covadonga, the Angliru, the Bola del Mundo to Tourmalet, Galibier, Stelvio, Gavia, Mont Ventoux or Alpe d’Huez. Surely that’s a matter of habit, eg Huez surely took time for people to learn to say correctly? i thought of that some time after posting and you’re probably right that familiarity supports comfort. Err… surely it depends which language you speak? I can do ‘Lagos de Covadonga’ but still can’t say ‘Huez’. in Sierra Nevada, the various ascents up Pico de Veleta. Doesnt matter if you start in Granada, Guejar Sierra, Cenes de la Vaga or Barrio de la Vega – if you ride A4025 or A395, if you stop in 2100m where the ski town begins, in 2400 where it stops, in 2500m when the road is closed for cars and moterbikes, in 2800m at the oberservatory/mulitary listning post or if you go to the end of the asphalt at 3200m or all the way to the top (ex 20m) at 3360-3380m. A giant of a climb and used a lot for training by pros thanks to the sports performance base up there, as well as in the Vuelta. Perhaps a problem is the “various ascents” up, no established route? I visit the Pyrennes in september 2014 and it looks “Closed for the season”. Most of the hôtels and restaurant were closed even if the temperature was very good. That’s great for road bikes but a bit sad for the evening diner… Retaurant, grocery stores, rental stores were often closed. Is seems that in general, the spanish population are not very big fan of outdoor mountain sports, at least, not like in north america, where thoses kind of places are more crowded every year. Perhaps one of the points here that the big climbs in the Alps and the Pyrenees have a mystique associated with the fact they are part of famous mountain ranges which you would come across when you are learning geography in primary school. You’s be hard pressed to know the names of the ranges climbs like the Angliru or Bola del Mundo are part of. In the tour going to the Pyrenees or the Alps is a part of the brand of the race, as is the dolomites or the Alps in the Giro. One of the things that strikes me with the disjointed way stages in the Vuelta are put together. Flat days mix with mountain top or hill-top finishes much more frequently. 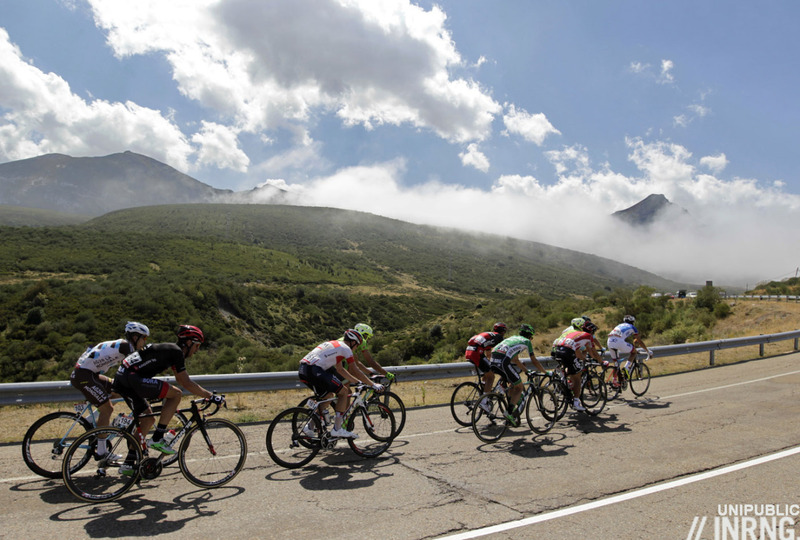 Even the pyrenees are not visited by the Vuelta every year, and often only for one stage. Also stages tend to be clustered in a certain areas of the country which differs from year to year. For me, this means that Vuelta’s geographic identity is not quite established well enough as the Tour’s or the Giro’s. +1. The Vuelta often strikes me as a bit “all over the place”. There seem to be few fixed points. This helps, in my mind, to give it less of an identity. Interesting piece, but allow me to provide some context. 1) The Vuelta is itself less “iconized” than its peers, because it’s the youngest ones, and for a long time wasn’t really reported on outside Spain (and, to be honest, the race wasn’t always worth it back then). So there’s little global imagery of Vuelta battles in black and white in the 1950s and the like. 2) The Vuelta suffered a severe hiatus when it changed hands, from a Basque media group (Correo), to a Madrid agency (Unipublic) in the late 70s. Until then, some of the most important and decisive climbs had been Basque (Orduña, Urkiola, Arrate). After that, the Vuelta didn’t even cross the Basque Country for fear of terrorism. So “iconic-to-be” climbs changed, and went to Asturias, Central Spain, and the Pyrenees. 3) Nevertheless, some of the “traditional” Vuelta climbs: Pajares, El Escudo, Navacerrada (the Bola del Mundo is just its continuation), La Morcuera, Los Leones, La Bonaigua, have continued to feature regularly, although, being major communication routes, the roads are now too wide and well-surfaced to play the same role. But many of them have stories, and it’s just a matter of telling the tale. Who remembers the fight between Merckx and Ocaña over Orduña? Who remembers that it was over La Bonaigua, the Covadonga Lakes, and Pajares where Hinault was repeatedly defeated in 1983, and that it was over the Puerto de Serranillos that the Badger rode his cavalcade putting 20 minutes on the yellow jersey? Who knows the name of the climb near Madrid where Delgado put 6 minutes on poor uninformed Robert Millar? How many remember Frank Vandenbroucke’s number over that climb near Avila where Fignon and Jalabert also did their own? Who will remember that it was over the Morcuera that Aru won his Vuelta over Dumoulin? 4) I dare say that the Covadonga Lakes cannot be behind the Mortirolo in “mythicality”. It has a long history of good battles (albeit tarnished in the XXIst century, until yesterday), if your memory is long enough: Millar vs Delgado in 1985/6, both crushing Fignon, Herrera beating Sean Kelly in 1987, etc..) Besides, it’s gorgeous. Similarly, El Angliru is not second to Zoncolan in that perspective. Honestly, I was slightly surprised to see the “Roads to Ride” section includes La Farrapona and not the really significant ones, in Asturias and elsewhere. 5) Over the last years, the Vuelta has had a policy of enlarging its base of soon-to-be traditional climbs, which is why the Lakes don’t feature every year as they used to, and neither does any other climb. I think it’s a wise step ahead, that will increase the fame of those mountains in the next decades. 6)The funny thing is that, with its emphasis on multipied summit finishes, very good passes, some of them very big, are still to be discovered and employed in stages that don’t finish on a mountain-top. Let’s hope Mr. Guillén will correct his policy and appreciate the value of those. In summary, it’s not so much that the Vuelta climbs are less well-known, it’s the race’s history that is less well-known (and told). Enjoyed that Bundle, thanks for some fascinating facts! +1 Thanks for posting this. Yet another reason to hang out here! Good stuff there Bundle. It prompts me to wonder how much the “Balkanized” nature of Spain works against it becoming the icon that the Tour and Giro are. For VDB, it’s Navalmoral. Some name I will always remember. As several people mention, Spain actually has too many mountain ranges – it is IIRC the most mountainous country in Europe. Too much choice. Still, not much “prominence” (not using the word in a very technical sense, just to suggest an impressionistic idea): a lot of relatively-high-altitude plateaux. Which makes it a bit more complicated to find *big* climbs. The low density of the population doesn’t help much, either. This is the point. Most of central Spain is on a plateau averaging 600m altitude aprox. Most of the climbs start at 1000m, and the highest peaks are around 2400m. Not much room for giant ascents. In the same way, population density is low, so there are no many roads, which unhelps repetition. What keeps La Vuelta away from the Canary Islands, is it interference with tourism, finances, logistics, politics? Tiede of course would be the obvious draw, but the neighbouring island of Gran Canaria also has a summit near 2000m. Two potential jewels that could attain huge popularity and serve up a spectacle. All of those reasons at different times it seems. The Canarias seem to be a project that’s always under review. My spelling / pronunciation of Teide should be also. All stems from a holiday pre-internet days and a debate on how to say Teide. You can tell I was wrong! Teide would make for an awesome stage, but I wonder if the cost of transporting all the equipment, bikes, etc. would be prohibitive. Gran Canaria is a wonderful place to ride your bike. Calm roads in the mountains, plenty of options to make some great loops. Pico de las Nieves tops at 2000m of altitude and can be climbed from many sides. But a real gem is Paso de Tauro from Mogan with some brilliant switchbacks! One of my favourite climbs ever. Then there is the fearsome Valley of Tears with ramps reaching 20%. IMHO Gran Canaria is much better than Tenerife because apart from Teide there’s not much more to ride. For someone wanting to explore and get some great climbing under his belt while also enjoying the most astonishing views Gran Canaria is the place to go, particularly in early spring, when the weather in Europe can be pretty messy. The whole Anaga area (North-Eastern corner of Tenerife) and the Isla Baja (the Garachico, Buenavista, Masca triangle, in the most Western corner of the island) offer impressive rides in Tenerife, and I’d argue that the views are often way more impressive than in Gran Canaria. Besides, the Anaga “laurisilva” (more or less, a tropical-like forest) can’t be found in Gran Canaria, nor the huge pinewoods. The rural area around La Esperanza has got plenty of climbs, too. The old road connecting the Northern and the Southern part of the island (TF-28) is really interesting, too, for a different kind of ride, albeit it needs a good deal of work on its surface, here and there. IMHO, the problem with Tenerife is that most tourists are blindly conveyed to the most Southern part of the island, which, besides being way uglier (because of the building abuse all over the coast… something which you’ll notice in Gran Canaria, too), is hugely more complicated to get away from – at least on a bike – when compared with the situation in Gran Canaria. Even the best climb up to the Teide starts some 80 kms away (by car – and that’s some 100 kms away if you’re riding a bike) from the most touristic area. It’s not like the North hasn’t got a few hotels and so, it’s just that 98% of the tourists are going to the other side of the island. Why does it work like that? Well, mainly because the Northern part of the islands (throughout all the seven main islands) hasn’t got any eternal sunshine. Clouds, even rain, can show up in an Azores-like showing of Atlantic climate which can last weeks and whose presence is hard to forecast. It’s not a seasonal thing. You won’t see the temperature drop anywhere below some 15º but, hey, gray skies are not what people come here for, are they? That might indeed be a fine reason to opt for Gran Canaria, whose Southern part offers a few decent roads which will grant you a sunny ride. OTOH, if you’re feeling lucky or if your priority is just riding and not your final bike tan, Tenerife can offer a lot – more than Gran Canaria, I’d dare to say, but that’s pretty personal. It’s not like you won’t get sun in Tenerife, you just can’t know. And that’s too hard to endure for most tourists, nowadays. However, truth is that I’d really go for a Tenerife-La Gomera double… like some 4 + 2 stages (and if one wants a *really* hard climb with astonishing views, La Palma and the Roque de Los Muchachos might be your choice). If you stay in Los Cristianos, you don’t have 80km to get to a good climb. You basically are at the beginning of a good climb up to Teide via the TF-51 to Villaflor. If you want prettier climbs, then it’s “only” 15 km to the TF-563 climb (signed as a scenic route), or 19 km to the TF-21 climb from Grenadilla. The TF-38 climb from Chio is 27 km away. So not that far away… The TF-28 out to Grenadilla starts with a decent climb too. The initial road out to Chio for the TF-38 climb is not at all scenic or fun to ride. The TF-38 climb itself, the road surface is poor in many places – tolerable but irritating ascending, but be very careful descending. The TF-563 is a cracking climb, but is one of the steeper ones – some prolonged steep sections. The TF-21 from Grenadilla has amazing views and is a lovely climb – Mike Cotty / Col Collective has a video on this one. Only driven it, but the TF-21 from La Orotava to Teide looks excellent – though busy with traffic on lower slopes. Thanks Paul, I quite know the area despite living elsewhere, but your suggestions might be pretty useful for whoever decides to spend some time in Southern Tenerife. However, I was speaking of the “best” climb up the Teide, which for me is the one from La Laguna. I like the TF-21, but it’s some twenty quite unpleasant kms away from Los Cristianos, not to speak if you’re staying in Arona or Adeje. It’s nearer if one stays in El Médano. I remember the first kms of the TF-28 until Chafoya as a big road, very unpleasant because of the traffic. They told me that in more recent years it has been asphalted a different little road up to La Camella, the Camino Real de Llano Azul, but I never tried it. I just detest riding on big trafficked roads or in urban areas (I like to cycle around in cities, but not to “ride” 😛 ) – something which can be pretty much avoided in the Northern part of the island. I also hate busy roads. That’s exactly what I like about Spain. My favourite is the corner between the provinces of Salamanca, Caceres and Avila, around Bejar and the Jerte valley. La Covatilla is the big HC there, but there are many other good mountains and loops to ride in a 50km radius. And very, very few cars in sight. The next issue for me is that if you stay within easy reach of the start of the Laguna climb, you’re far away from /any/ other route. Generally I have only the mornings to cycle (see family) – and maybe one day I can take as 100% cycling for myself. The south-west there’s a number of climbs that were reachable and still I could be back before the afternoon. Puerto de la Cruz also seems to have some variety (certainly, lots of ways to get to TF-21 around Chasna, and /maybe/ some other tracks that meet TF-21 at Las Cañadas del Teide – not sure if they’re paved for road bikes (??)). The TF-28 from Los Cristianos is fairly horrid up to Chafoya, yes – indeed it’s pretty horrid up to La Camella – but there’s a decent shoulder on the road on the widest bits, so it’s not too bad. After La Camella it gets nicer. Whether you take the quieter TF-51 climb, or whether you go on on the TF-28 to get to the TF-563 or Grenadilla climbs. That said I spend most of my time cycling in a country where the roads generally have no shoulders for cyclists to shelter on, where you have to cycle sharing single-lane roads with 100 to 120 km/h motor vehicle traffic, and where a non-trivial proportion of the drivers of said motor vehicles view cyclists as vermin. I doubt that the distance is an insurmountable problem (nor the cost can be deemed as “prohibitive”, in absolute terms, I’d say) since the Vuelta already had some stages (the first ones) in the Canary Islands in 1988. Agreed, we could have three days in the Canaries then a rest day. (Much) madder ideas have happened in grand tours than that. How much have these foreign destinations paid for the “privilege” of hosting a grand tour start? And would Tenerife/The Canaries pay remotely the same? Hosting fees seem to me to be the only reason these races start elsewhere. Didn’t London pull out of hosting next year’s Tour start because some pen pusher (or possibly Boris the Moron) decided it was a few millions too expensive? Starts in foreign countries should be forbidden anyway. They add nothing to the sport, but money for organizers and companies. London has nothing to do with the TdF. Guess in your modern cycling world a Tour start in Quatar or Shanghai would be great. Hope I’m dead till that happens. La Vuelta has gained international appeal only in recent years, it’s not easy to build a “mythical” reputation for a climb if the best riders don’t fight in that ascent. Only some big names started the race in the past and the likes of Hinault made the climbs famous immediately, like Serranillos (sadly forgotten by organisers). Other problem is that in the past there weren’t climbs like the ones in the Giro and the Tour. An example is the Puerto de San Glorio, used for the first time only in 2014, that could have been like what some Pyrenean climb were for the Tour: too easy in recent days, but with a good history. And now Unipublic doesn’t want to “discover” some beautiful climbs that could easy become mythical in few years: La Marta, Gamoniteiro, Sierra de Lujar, Fonte da Cova, Pradell, Sierra Nevada from his different sides, the “spanish Finestre” Trobaniello and a lot more! But they continue to search short and steep climbs like Peña Cabarga and Camperona that I hope will never become iconic. Talking about “not new” climbs I think La Gallina and Ancares have a good chance to become mythical: really hard and not only a MTF, that is really important in my opinion. I would have said the Angliru was on about the same level as Zoncolan and Mortirolo. Ventoux, Stelvio etc have history that sets them apart as you say. A Vuelta that island hopped, with a stage on Mallorca and maybe Tenerife too would allow them to show off the climbs that are familiar to tourists. Great insights by all thanks. I would only add: All together these famous climbs are a valuable cultural capital “asset yet to appreciate”. I can only hope that the Velta may some day become financially more substantive for Spain and her beautiful country. Inrng – have you done a review of Viva La Vuelta? I am always tempted by it as I love the Vuelta, but am wary of overly dry cycling histories which just recount the facts rather than search for the more human or anecdotal aspects of a race. Chris Sidwell’s ‘Race for Madmen’ was great at this and was wondering if Viva La Vuelta is of a similar style. Guess the Tour has much more of a mythology surrounding it given its bigger status, but a well-researched history of the Vuelta would be so entertaining, particularly as many of the stories would be new to most readers. Not a great book imho but it’s been a while since I read it. A new history of the race is long overdue. Some great posts on here, but in general I would concur with the view that it’s the general historical lack of interest in La Vuelta compared to its more starred rivals. Actually ASO have done a pretty decent job of revamping the race in recent years helped by some epic racing. 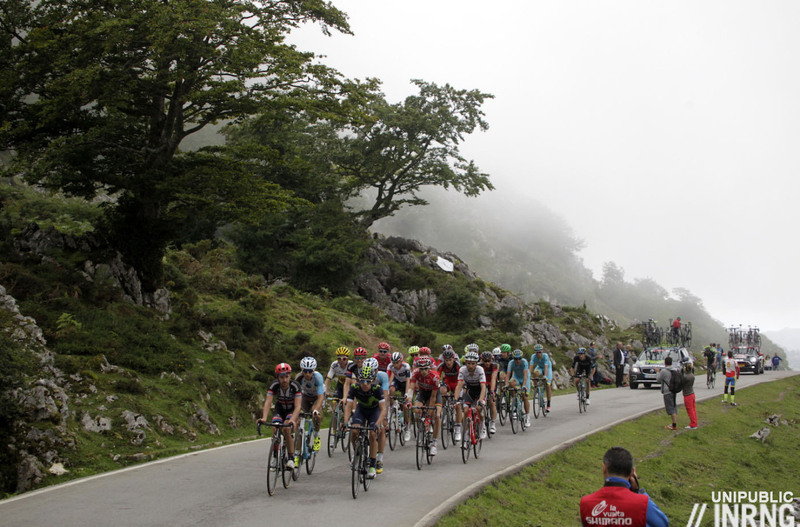 Monday’s stage on Lagos de Covadonga was way more exciting and unpredictable than anything served up on this year’s Tour. With racing like that La Vuelta will only increase in popularity and its climbs become more storied. I don’t agree. El Angliru is – in my opinion – already mythical, despite only being raced for the first time in ’99. Lagos de Covadonga also is an epic climb, just like Bola del Mundo. A mountain doesn’t need to be well-known to be granted the title ‘mythical’. There’s a difference between being famous and being mythical. Mount Ventoux is mythical, because of the landscape, Tom Simpson, Armstrong vs. Pantani, the observatory, etc. Alpe d’Huez is just popular, very popular. But it doesn’t have the spectacular views, it’s not a nice village, … in fact I’ve found the ride a bit boring. Col de Sarenne has a far more mythical feeling to it – but logistics are a mess up there (nature deserves a win too). And besides: the Vuelta in recent years is far more interesting then the TdF and has had much more variety in climbs. In my eyes that’s a strength, not a weakness. Repetition helps to grow a name, but in the end repetition is also boring. The stage won by F. Schleck last year for example had a beautiful climb at the end – don’t recall the name. The Vuelta stages just never disappoint me.